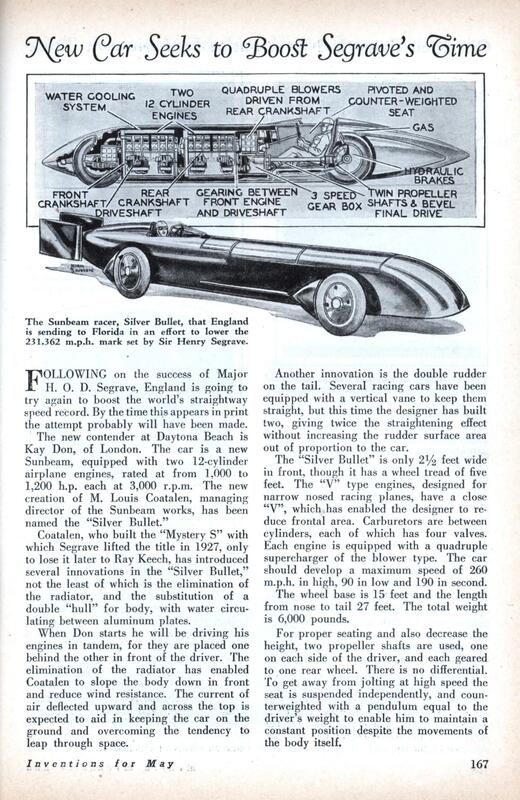 Coatalen, who built the “Mystery S” with which Segrave lifted the title in 1927, only to lose it later to Bay Keech, has introduced several innovations in the “Silver Bullet,” not the least of which is the elimination of the radiator, and the substitution of a double “hull” for body, with water circulating between aluminum plates. When Don starts he will be driving his engines in tandem, for they are placed one behind the other in front of the driver. The elimination of the radiator has enabled Coatalen to slope the body down in front and reduce wind resistance. The current of air deflected upward and across the top is expected to aid in keeping the car on the ground and overcoming the tendency to leap through space. Another innovation is the double rudder on the tail. Several racing cars have been equipped with a vertical vane to keep them straight, but this time the designer has built two, giving twice the straightening effect without increasing the rudder surface area out of proportion to the car. The “Silver Bullet” is only 2-1/2 feet wide in front, though it has a wheel tread of five feet. The “V” type engines, designed for narrow nosed racing planes, have a close “V”, which has enabled the designer to reduce frontal area. Carburetors are between cylinders, each of which has four valves. Each engine is equipped with a quadruple supercharger of the blower type. The car should develop a maximum speed of 260 m.p.h, in high, 90 in low and 190 in second. The wheel base is 15 feet and the length from nose to tail 27 feet. The total weight is 6,000 pounds. For proper seating and also decrease the height, two propeller shafts are used, one on each side of the driver, and each geared to one rear wheel. There is no differential. To get away from jolting at high speed the seat is suspended independently, and counterweighted with a pendulum equal to the driver’s weight to enable him to maintain a constant position despite the movements of the body itself. This evidently didn’t work out, as he doesn’t appear in the chronology of the land speed record on the Wikipedia. The then record holder was Henry Seagrave in the remarkable “Golden Arrow”, which had to be steered using a periscope as the driver’s cab had no forward view at all. The record was subsequently taken by Malcolm Campbell. Seagrave and Campbell both died making attempts on the water speed record. Kaye Don tried for both, but was lucky enough to survive and indeed lived to be ninety.